From Paris to New York, Tokyo to San Francisco, developers from around the world turned out for Foursquare’s global hackathon this past weekend. The aim? Like any good hackathon, to seed innovations in a round-the-clock binge of hacking and 5-Hour Energy. From Paris to New York, Tokyo to San Francisco, developers from around the world turned out for Foursquare‘s global hackathon this past weekend. The aim? Like any good hackathon, to seed innovations in a round-the-clock binge of hacking and 5-Hour Energy. By the time Fast Company arrived to New York’s gathering at General Assembly, many of the bleary-eyed devs had already moved on from 5-Hour Energy to Sixpoint beer (basically a deconstructed Four Loko) in celebration of all they had accomplished in such a short span. Here are three of the creations we found particularly fun and interesting. offices & buildings, parks & outdoor, travel). Created by Max Stoller and Tal Safran, How [Blank] Are You? is a service that crosses Foursquare check-ins with 2010 census data to give a sense of the demographics of the neighborhoods you most often hang out in. The service is broken down by a few intentionally simplified metrics (gender, marital status, race) to answer one question: How [blank] are you? That is, how white are you? How female are you? Or how single are you? For example, if you check in to 10014 (Manhattan’s West Village) or 11211 (Williamsburg, Brooklyn), the service might say you’re 80% white, meaning you often bounce around to predominantly Caucasian neighborhoods. When plugging in his own data, the service concluded that Stoller was 10% divorced. “That’s about right,” he joked. 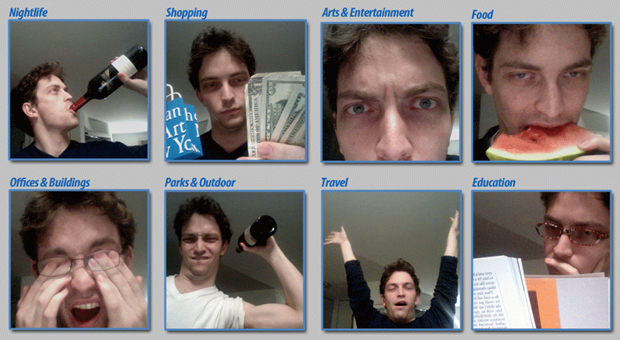 Remember George Costanza’s app from the Seinfeld reunion meta-featured onCurb Your Enthusiasm? Called the iToilet, Georgie Boy’s fictional service was designed to help iPhone users locate the nearest “acceptable” public bathroom via GPS. 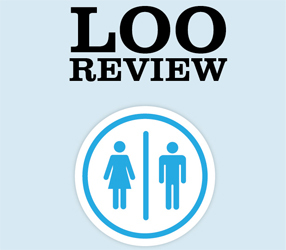 Now Jon Gottfried, developer evangelist at Twilio, has turned that fiction into a reality with Loo Review, an app that does exactly as its name suggests: a Yelp for restrooms. By pulling in Foursquare location data, Gottfried has enabled users to snap photos of bathrooms, tie them to check-ins, and have the app “scan” the image to rate the cleanliness of facilities. His central finding? Don’t use the W.C. at the Equinox in midtown.